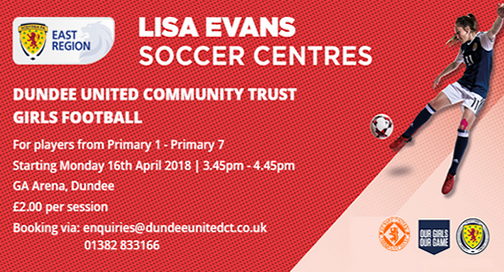 Dundee United Community Trust (DUCT) on 20 March was delighted to announce a brand new football coaching session for girls in primary 1 – primary 7 every Monday from 3.45pm – 4.45pm at the GA Arena in partnership with the Scottish FA East Region. The Lisa Evans Soccer Centre will officially launch at the GA Arena on Monday 16th April and the first session is free for any girls who want to take part (£2 per session thereafter). Places are limited so please book fast to avoid disappointment. The Trust have been developing links in the girls game recently to build upon the success of our Women’s Team and this new session is a great way to support the growth of the girls game in Dundee. This new session is part of a national programme which aims to provide a fun environment for young girls to perfect their football skills, build confidence and make new friends and uses Scottish Women's National Team player Lisa Evans as the ambassador for the East Region. Places are limited and can be booked by emailing enquiries@dundeeunitedct.co.uk or by calling the Community Trust office on 01382 833 166.